Do the tribal people of Banaskantha district in Gujarat have to face official indifference towards getting simple formalities done for getting their subsidized ration from fair price shops? It would seem so, if impressions gathered during the latest campaign by the premier Gujarat body propagating the right to information (RTI), Mahiti Adhikar Gujarat Pahel (MAGP), are any indication. Currently on a tour of Gujarat’s eastern tribal belt for making RTI popular, the MAGP found exactly this when the RTI on Wheels reached the mamlatdar office at Bhabhar taluka in Banaskantha district, where tribals live. “This made me to turn to the official, and ask him to look into her problem. Looking at my camera, she was asked to be seated on the chair. A simple piece of information about how she could add her thumb impression to the computer data to access her public distribution system (PDS) ration was given to her after three long months! If we were not there, she might have been asked to pay Rs 50 or Rs 100 to do the job”, the activist said. “Two days after the incident we got a phone call, and she was so happy. Finally she was able to get her ration! Who was this woman? One might wonder. Does that really matter? Name her as Bhikhiben, Kamuben or Somaben… She is one of the faces among thousands who have been denied ration! Gujarat has heavy migration ratio. People migrate when there are no local livelihood options. This period if very crucial, and families experience food insecurity. It is time when the government becomes more proactive to ensure families get their PDS quota”, Jog pointed out. The RTI caravan, which she claimed was “getting very good response” and was also leading to “amazing impact” in the tribal area, was helping people connect with the RTI, motivating them to file RTI for seeking accountability from the government, she said, adding, "The RTI on Wheels visited government offices to checked the status of disclosures, discussed issues with officers, and gave them inputs on RTI”. The Bhabhar mamlatdar office, interestingly, was found not following the RTI rules, which make voluntary disclosures mandatory. “As per section 4 of the RTI Act, information needs to be proactively disclosed – disseminated. 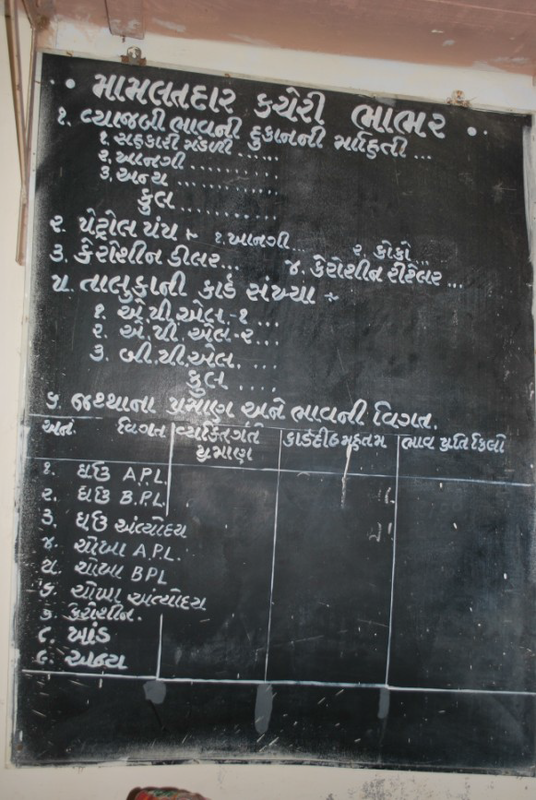 A notice board was put inside the office (as seen in the photograph), but no information was provided on it, and Bhabhar was no exception,” Jog said.